Weddings, particularly, large complex weddings can have a lot of moving pieces. When it comes time for the big day, there are many things that you need to have planned for in great detail and pay attention to. This is especially true for wedding transportation. While wedding transportation can be a fairly straightforward affair, particularly when you’re just dealing with one or two vehicles, things can get complicated quickly when you scale up to deal with dozens or even a hundred or more guests. In the wedding planning business, wedding transportation is often low on the priority list of wedding planners and the bridal party, considering all of the other details that have to be planned beforehand. Over the years Brilliant Transportation has been selected by the most discerning wedding planners and families to handle their most important celebrations. We pride ourselves not only on providing exceptional service during your event but also beforehand throughout the planning stages as well as when the event is winding down. Let me explain in some detail how the coordination process works and give additional reasons why it is so important to have someone oversee these details. For the purposes of this discussion, I will be referring to large wedding events with 100 or more guests. We recommend a minimum of 2-3 dry runs before the big day. The first one (“Site Inspection”) should happen about a month in advance. The onsite coordinator will come to the location and make sure to study the venue, its surrounding roadways and other factors that could affect the event. This first visit will enable us to give you a very detailed account of what vehicles and how many would be best for your big day as well as what part of the event logistics might need adjustments. We can decide on routes for transportation, drop-off locations for guests and where to stage the vehicles. The second dry run should be within a week of the event. Sometimes locations change their layouts; there might be construction on one of the roads surrounding the venue or other factors potentially affecting transportation might have been altered. The last dry run should happen the day of the event when all the people involved will be onsite, and a final guest count is available. Loading time, for example, is an important factor that can only be accurately projected once the final number of attending guests is established. Extra clothing and umbrellas guests might bring because of a change in weather could also have an effect on the timeline. The job of the onsite coordinator and their primary responsibility during the event is to track the drivers and vehicles, along with your list of invited guests to make sure everyone meets up with each other at the correct time and place. Many times, when you have guests coming from more than one hotel, and you need multiple vehicles to handle those guests, it is advisable to have an onsite coordinator for each location, including one at the wedding venue. For hotel pick ups, it’s advisable to assign a hotel onsite coordinator to each location making sure that all of the invited guests get picked up at the right time. One might think that if you only have a few guests staying at one hotel, paying for a coordinator to help them probably wouldn’t be worth the cost. However, consider that regardless of how many guests you’re dealing with, they will always appreciate the service, nonetheless. At busy hotels, people and groups are arriving and departing all the time. It can get quite hectic on weekend afternoons which will probably coincide with the timing of your wedding plans. If you don’t have someone organizing and leading your group of guests, it could be very easy for some of them to get on the wrong bus or shuttle and end up going to the wrong event. Don’t assume that your wedding guests will be the only hotel guests attending an event, particularly during peak wedding season. The onsite coordinator will check in with all of your guests and make sure they’re aware of and ready for the appointed shuttle pick up. That way none of the guests will get left behind and the coordinator can hold the shuttle from departing if key members of your wedding party are running late. The onsite coordinator also checks in with all of the drivers and vehicles to make sure they aren’t late for the pickup. If there is a problem, the coordinator can contact base to troubleshoot the issue, or even send a different driver. The onsite coordinator will also contact the coordinator or responsible party at the wedding site to let them know of a potential delay. 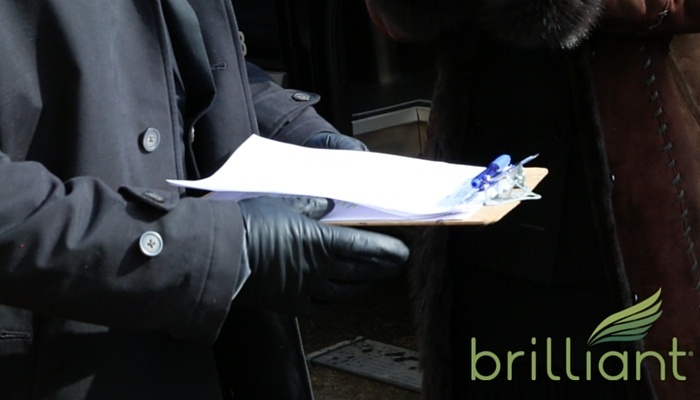 Brilliant Transportation always has a dispatcher in place at base who not only communicates with the drivers to make sure they’re on time and going to the right place, but also is in constant contact with the onsite coordinator as your main link between the transportation vendor and your wedding party. Large, elaborate wedding events are like any other special events, with many vendors and different locations at the venue involved. Thus, it’s important to have someone to direct traffic and communicate arrival information with the wedding planner and the onsite vendors. The onsite venue coordinator lets the wedding planner or event producer know when to expect the wedding guests to arrive, down to the minute. They check in with the drivers or the hotel coordinators to confirm when the shuttles have left the hotels and find out at what time the shuttles will be arriving. The coordinator’s communication with the wedding vendors is crucial because they need to know when to cue the music and lights or start the entertainment when the guests arrive. Similarly, at the reception, the caterers need to know when they can start serving food and drinks, or how much time they have left to finish their final preparations. Once the shuttles arrive, the onsites will direct the drivers to the correct drop off location, help the guests disembark, and guide them to the right building or location for the ceremony and later, for the reception. The coordinators will then direct the drivers to the correct parking location or show them where to stage their vehicles if there is no on-site parking. Judging from our extended experience, a large wedding of 200 guests could have anywhere from 4 to 15 shuttle vehicles needing directions for unloading and parking. For the guests who arrive in their personal vehicles, the coordinators will help to get them parked and serve as the communication link between the guests and your valets and parking staff. If you have a group of shuttle drivers staying for the duration of the event, which could last several hours, the coordinator will also liaison with caterers and venue staff to make sure the drivers can get food and water. At the end of the festivities, this process unfolds in reverse, and its smooth operation is no less important for your guests to enjoy a satisfactory wedding experience. When it’s time to leave, the coordinator will direct the shuttle drivers in regards to when it’s time to pick up the guests, and to make sure all the guests can load up smoothly. If you have elderly guests, people who might have walkers or wheelchairs, or parents with young children, the coordinators render assistance and help guests get on board the shuttles and find their seats. So as you can see, with large groups there is so much involved in getting them to the right place at the right time, whether they’re coming or going. And the more guests involved, the greater the need to have a corresponding increase in staff members, vendors, and coordinators to interface with them. Remember, during a big production, many things are going to happening at the same time. So it’s important to have an adequate team in place. If you have 100 or more guests, you’re going to want to have more than one coordinator. The complexity, the volume and because nobody can be in two places at once or communicate with 20 different staff members at the same time makes it clear why extra hands on deck are needed. Despite the complexity and the costs involved, it will be worthwhile in the end because the coordination and direction will ensure that your guests have a great time. For big events, the wedding planner or bridal party wouldn’t want to shortchange their guests by not having enough caterers or ushers and the same goes for your transportation staffing needs.